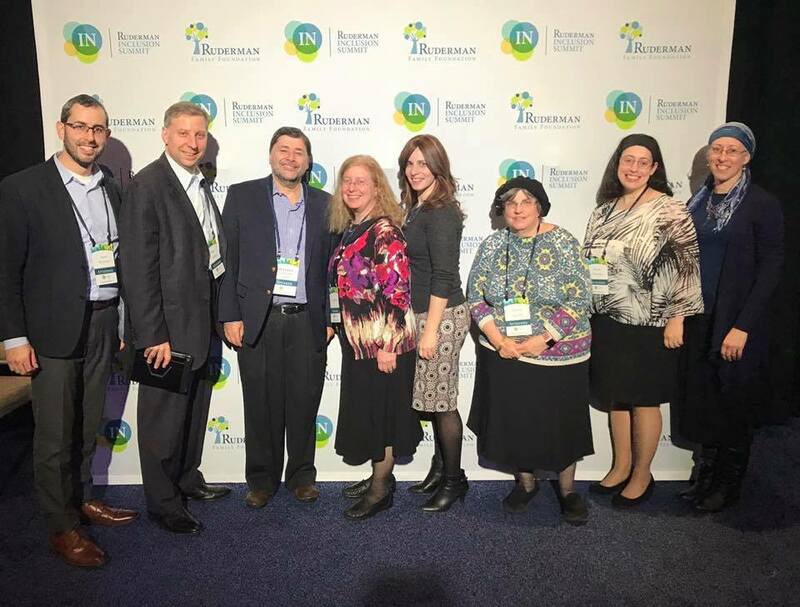 Sixteen staff members and twenty volunteers from Yachad, the National Jewish Council for Disabilities, including Dr. Jeffrey Lichtman, Rabbi Ahron Rosenthal, Ken Saibel, Liz Offen, Tzivia Jofen, Batya Jacob, Becca Zebovitz, and Rina Hoffman, attended the Ruderman Inclusion Summit. The summit, held November 19 -20 in Boston, brought together over 1,300 disability advocates from around the world to inspire, network, motivate each other, learn about advances in disability inclusion, and listen to speakers including Marlee Matlin, Dr. Joyce Banda, Mandy Harvey, and Senator Maggie Hassan. As a grant recipient, Yachad was invited to be a co-promoter, helping to get the word out, taking part in activities at the summit, and providing volunteers–high school and college students and young professionals who have been involved in Yachad as peer participants and who are committed to inclusion for people with disabilities. Yachad members like Jonathan Spiller also volunteered and attended workshops and met influential individuals. Jonathan was very active in his role at the summit and even wrote a song about his experience. He volunteered at the art station where an enormous mural was created. Liz Offen, Director of New England Yachad, organized a panel on Inclusive Social and Recreational Programs as part of the segment of Affinity Groups. Panelists included Chenine Peloquin, Director of Access Recreation, Dan Minnich, Co-Director of Waypoint Adventures, and Charles Baldwin of the Massachusetts Cultural Council. The panel discussed how to work with partners to collaborate on inclusive social and recreational programs, an area where Yachad has been successful. They discussed ways state and nonprofit agencies can work together, and how people of all ages and all abilities can participate in sports and cultural programs as well as after-school and weekend programs. There was a lively debate about what “inclusion” means and what constitutes a disability. Ilana Kruger and Alessandra Rigamonti from Yachad attended the summit’s Link20 networking day. Link20 is a leadership network for young disability advocates that began in Israel and expanded to Boston, New York, and Washington DC this year. Its goal is to develop a young, cross-disability movement, one that links all disability communities. Link20 works to raise awareness and shatter stereotypes about people with disabilities. 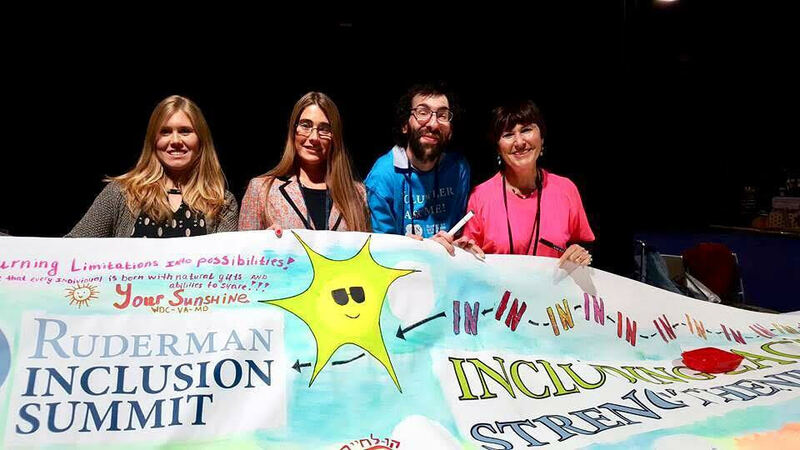 “The goal of the summit was to show that we have the power to create change and to highlight some of the successes in disability rights around the world. The summit stressed that this is a civil rights movement and how vital it is to elevate the issues around disabilities and uplift the narrative about inclusion,” added Ms. Offen. Presenters from across the world included politicians, Hollywood actors, athletes, models, business entrepreneurs, writers, and singers, mixed in with agency heads, community organizers, members of synagogue inclusion committees, educators, camp personnel and self-advocates. It was a unique and thought-provoking two day summit that brought together more than one thousand powerful voices to sing and shout and talk together about a common theme—disability rights are important issues and the time for change is now.